Well-priced, quality package that packs a punch and doesn't slip off your leg as easily as certain guitars. Tidy build. Lovely neck. More ergonomic than an Ovation. Works well in ensembles. Preamp markings hard to read. The JHS-owned Vintage brand has built quite a reputation for affordable quality, both in the acoustic and electric worlds. Both ranges include numerous clones of the classics, but it's in its acoustic range that we've seen really interesting instruments. 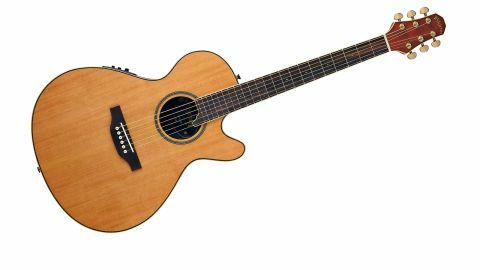 Guitars designed in conjunction with Gordon Giltrap and Paul Brett, for example, have brought something a little different to the low-to-mid-priced acoustic market. Pilgrim is another: a blast from the past that's been transported through time into today's very different market. Pilgrim's Paul Tebbutt explains his design might have been heavily influenced by Ovation's bowlback concept, but from the outset it was quite a different beast. This new Mayflower Deluxe, like the standard Pilgrim model that reappeared back in 2010, might use the standard Ovation 641mm (25.25-inch) scale, with a flatter fingerboard radius, and a fibreglass bowlback, but its outline is vastly different, and key to the design. It's much more waisted, with a more pronounced horn. It's approximately 393mm across the body - around 6mm smaller than Ovations - likewise in length and indeed the depth, which if you're familiar with your Ovations equates to a lightly shallower 'mid-depth' bowl. "The Mayflower has quite a projecting voice that really works in an ensemble setting"
These changes are important, as an Ovation, even with a still bulbous mid-depth bowl, certainly played seated, takes some adjustment. The subtle changes to the bowl's contours here, not least a flatter side in the treble-side waist, mean that the Mayflower simply feels more manageable, both seated - especially if you cross your right leg, flamenco-style - and strapped on. The top is a nice-looking piece of solid cedar with some clean inlays around the soundhole and inside the lightly figured maple binding. Internally, there's a fairly standard X-brace, and like many of the newer-generation Vintage instruments we've seen, overall it's pretty clean. The three-piece neck, with thin black ebony stringers between the central maple section and outer mahogany pieces, is satin finished. With the maple binding wrapping the rosewood fingerboard, it captures the quite folksy British vibe of the original, although the headstock, while perfectly functional, is a little 'vanilla' compared to the more distinctive Ovation design. The medium frets are very nicely fitted and polished; the bone nut and saddle are well done, too, although there's no compensation on the latter. As you'd expect, powering is more mainstream than the original Pilgrim or Ovations; we have Fishman's Sonicore under-saddle mated to the well-spec'd Presys+ preamp, although it sits on the lower bass side, below the waist like an Ovation, and means all the legends are upside-down viewed in playing position. Once you've adjusted to the feel of the bowlback, it's a fine guitar with a solid-feeling D-shaped neck profile. Unplugged, the sound is a bass light, there's a little honk and it's not the woodiest tone we've heard. But there's something about these guitars that makes them seriously good rhythm instruments, especially for rockier styles where you don't want scooped mids and high-end sparkle. "It's the sort of solidly built guitar that will probably still be here after the apocalypse"
Frankly, you want some dirt. But it has a softer side, too: fingerpicked, dropped tunings worked better than we imagined, both unplugged and plugged in, where the Fishman system does a decent job of losing some of those honkier mids and extending the lows. As we've said before, this is a neat preamp... if only there were some contrasting control markers: small black knobs on a black fascia, onstage, just don't work. That gripe aside, the Mayflower has quite a projecting voice that really works in an ensemble setting, as well as with modulation, delay and reverb, blurring the lines a little between traditional 'acoustic' and 'electric'. There's something classy about this package - not least the leather-detailed gigbag. Aside from its almost David and Goliath-like heritage, it's tidily made with a very solid, highly playable neck. It's slightly more manageable than a traditional Ovation bowlback, thanks to its altered geometry, and has a strong projection both acoustically and amplified; it's not the sort of sound that would inspire an album of solo guitar instrumentals, but it sits nicely with a fuller band mix or, conversely, the solo strummer who wants to rock out a bit. It's also the sort of solidly built guitar that will probably still be here after the apocalypse... along with the cockroaches and Keith Richards.